When enigmatic stranger Abel Wood (Tab Hunter) and wannabe singer Rosie (Divine) ride into the squalid New Mexico frontier town of Chili Verde in search of legendary buried gold, they face stiff competition getting their hands on the prized booty when they encounter brothel madam Marguerita (Lainie Kazan) and an outlaw gang headed by the villainous Hardcase Williams (Geoffrey Lewis). Originally entitled The Reverend and Rosie, actor Tab Hunter had written his parody of 1950s-era Hollywood westerns in 1975, and pitched it to various parties for nearly a decade until he finally got it made in 1984 with director Paul Bartel, who was best known for such subversive fare as 1975’s Death Race 2000, at the helm. 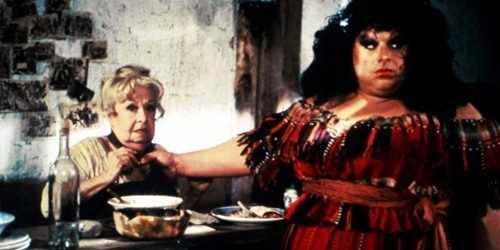 While the 300-pound transvestite actor Divine gives a hugely enjoyable, larger-than-life, performance (this was Glenn Milstead‘s breakout role) and Hunter delivers a spot-on homage to Clint Eastwood, its Lainie Kazan as the over-sexed brothel madam who is the film’s big stand out. 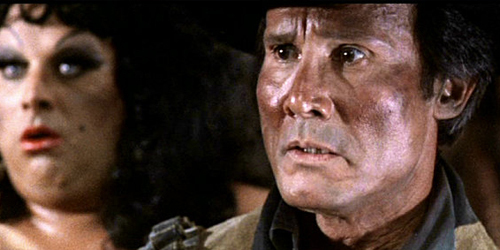 And chewing up the New Mexico desert scenery are veteran character actors Henry Silva, Woody Strode, and Cesar Romero, and if you look carefully, there’s a 13-year-old Noah Wyle somewhere in the mix. The comic Western parody gets a first-time UK release on Arrow’s cult ArrowDrome label, presented here in its original aspect ratio 2.35:1, and includes a trailer, reversible sleeve and collector’s booklet.